s to r i e s m a g a z i n e ? 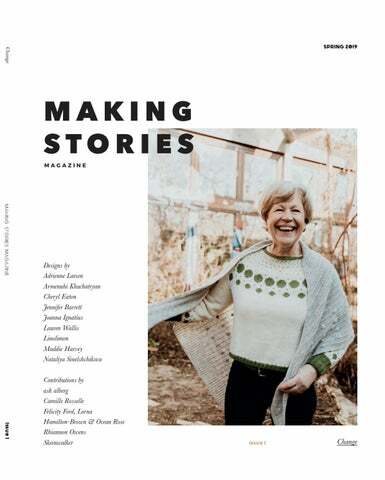 We’re (to our knowledge) the only ad-free knitting magazine on the market today. We believe in preserving our independence when it comes to deciding who we feature and work with through not accepting any ads for this magazine. We’re printing on 100% recycled paper, one of the few that’s certified not only with the EU Ecolabel and the Nordic Swan Ecolabel, but also with the Blauer Engel certificate. We’re keeping production and fulfilment as local as possible, working with Druckhaus Berlin-Mitte as our printer, the first printer to be certified with Blauer Engel, and with Urbanmail as our fulfilment and shipping partner, both here in Berlin. w h o ’ s b e h i n d m a k i n g s to r i e s magazine? In Issue 1, you’ll find thoughtful accessories and versatile garments that are designed with change in mind - change in seasons, in the way we work and live, in our choice of materials. We’re proud to be able to share the fantastic work of writers and visual artists with you with pieces that range from disability and knitting to body image, from queering the knitting status quo to what change means for our lives. Enjoy! â&#x20AC;&#x153;Oversized in the body for ultimate comfort, and fitted in the arms to give it the right amount of structure and poise.â&#x20AC;? â&#x20AC;&#x153;I tried to reflect the moment when the rain seemed to stop yet you can feel a lot of moisture in the air and it seems that it is still drizzling.â&#x20AC;? â&#x20AC;&#x153;When faced with change that is perceive as negative, often looking at it from a different point of view allows for the positive to be seen. This sweater is reversible, representing that shift of thinking.â&#x20AC;? â&#x20AC;&#x153;The design also represents waves of change through the simple, sinewy, crossed stitches which reflect the increasing awareness and knowledge of our impact on the natural world.â&#x20AC;? â&#x20AC;&#x153;Borobila is a jumper for dynamic persons in constant evolution, active persons.â&#x20AC;? â&#x20AC;&#x153;Rimy, inspired by the cold weather, walks in the woods and the need to keep warm, will be part of your key wardrobe, keeping you warm during those rimy autumn and winter days year after year.â&#x20AC;? moment: you can’t observe the whirlpool if you are in the midst of it. You need an opportunity to step back and observe from a distance. At a subconscious level, knitting does that to me. It’s as simple as pausing that train of thought for a microsecond so that I can step out. Is there anything else than change? Everything changes around us and in us every single second. Circumstances, seasons, our body, our mind and thoughts... Change is the only thing that doesn’t change; the only constant in the world. All the rest is just passing by, crossing our lives for a moment before it vanishes again. To me, crafting is a necessity in the midst of all these changes and as part of it. Stitch by stitch, I build a tangible thing in the world, a project that will give me and many others joy: the joy of doing, creating, learning, showing and wearing something we have made ourselves. Of course, sometimes, change seems to be more present and insistent in our lives. There are those moments of physical and mental turmoil where everything seems to dance in a whirlpool around us while we stand still, wondering what’s happening or wishing it was all over. New job; new house; new phase in life; a new addition to the family, or the loss of a dear one... We all know this, and if not, we’ll most probably encounter it at some point in our life. Preventing change is impossible. Fighting it is a recipe to feel even more miserable. The only way out is adapting to the change. Over and over again. Crafting is a training that gives me the patience and the skills to tackle some more challenging aspects of life. Crafting is a planned and controllable way to include change in my life, in full awareness, and to be content with it. In the end, the journey is the destination. Change is the only thing there is, whether we wish for something else or not. We can all welcome and embrace it. â&#x20AC;&#x153;Buying Lana Rara wool is not just buying some pretty wool, it is supporting a project that stands for rare breeds wool, local Swiss production and a sustainable lifestyle.â&#x20AC;? â&#x20AC;&#x153;Columella is inspired by the idea of a change in direction and specifically the chirality of some mollusc shells, which usually spiral to the right but occasionally spiral to the left.â&#x20AC;? Copyright ÂŠ 2019 Making Stories GmbH All rights reserved. No portion of this publication may be reproduced mechanically, electronically or by any other means, including photocopying, without written permission from Making Stories GmbH.